Humback whales off of Salt Cay. Salt Cay is a great place to see the annul humpback whale migration. 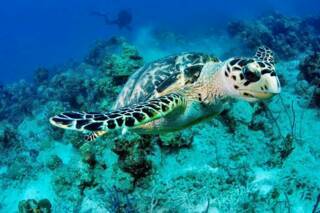 Snorkeling encounters in the water are often possible and will definitely be an amazing experience. NOTE: This activity is only offered during the months of January, February March and April. Annually during the winter season, humpback whales migrate from the northern Atlantic to warmer waters near the Caribbean. Typically originating from the vast waters surrounding north-western Europe, Greenland, Iceland, Canada and from inside the Arctic Circle, the majority of whales head for a relatively small region near the Turks and Caicos and Dominican Republic. The attraction of this region are a few shallow banks, which include the Silver Banks, Mouchoir Banks, and the Gentry Banks. The humpback whales make the long swim down to the Caribbean to give birth and to mate. A pod of humpback whales off of Salt Cay. Whales can be spotted in the deep water off of the Caicos Islands, but the best place in the country for humpback whale watching is in the Turks Islands Passage near Grand Turk and Salt Cay. The Turks and Caicos Islands are situated on a plateau that rises abruptly 10,000 feet (3048 metre) from the ocean floor. This plateau is partially split by the 6,000 foot (1830 metre) deep Turks Islands Passage which separates the Turks Islands from the Caicos Islands. Whales are naturally funnelled through this channel, and the naturally increased density of whales make Salt Cay and Grand Turk unrivalled sites for whale watching. It’s often possible to see whale calves with their mothers, along with pods of five or more whales. Male humpbacks sing a 10-20 minute complex and unique song, which can be heard for miles underwater. It’s not certain what this is for, but evidence suggests that it's a mating call. Unlike whale watching excursions offered at other destinations, smaller boats, often the same vessels used for diving and fishing expeditions, are the boats used for whale watching. Although they may not be as comfortable as a purpose-built larger vessel, such boats are often able to provide a closer view of the whales. 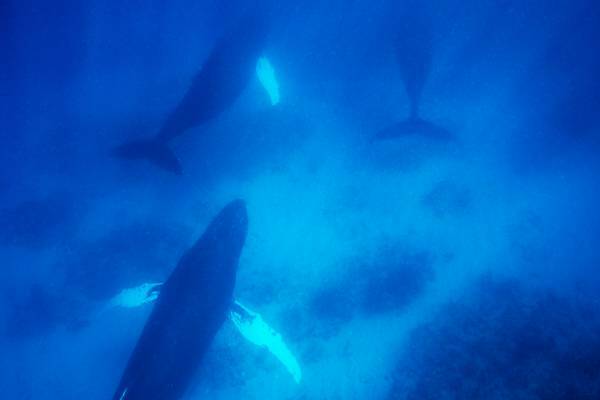 Depending on the mood of the whales, the ocean conditions, and other factors, it may be possible to snorkel with the whales. If the opportunity presents, we highly recommend taking advantage of it. An in water encounter will be an unforgettable experience. Humpback whales are wild animals and thus may be unpredictable. Do not chase or closely approach whales. Wear snorkelling vests when in the water. As should be the practice with all animals, do not harass or disturb the whales.